My Mom and I do a similar thing to this, but every night. Three things we are grateful for and three things we thought were good that day. It's really hard to do when you had a lousy day or are in a "funk" but it puts a bright spot on the day. Hope you are having a better day today. 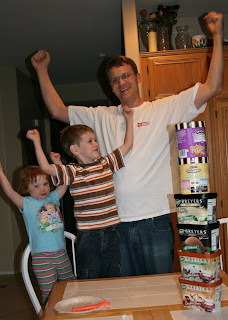 Look at that ice cream tower. Wow! These are great things to be thankful for/happy about. Nice list! Yay! I love the ice cream towers! That rocks my world.